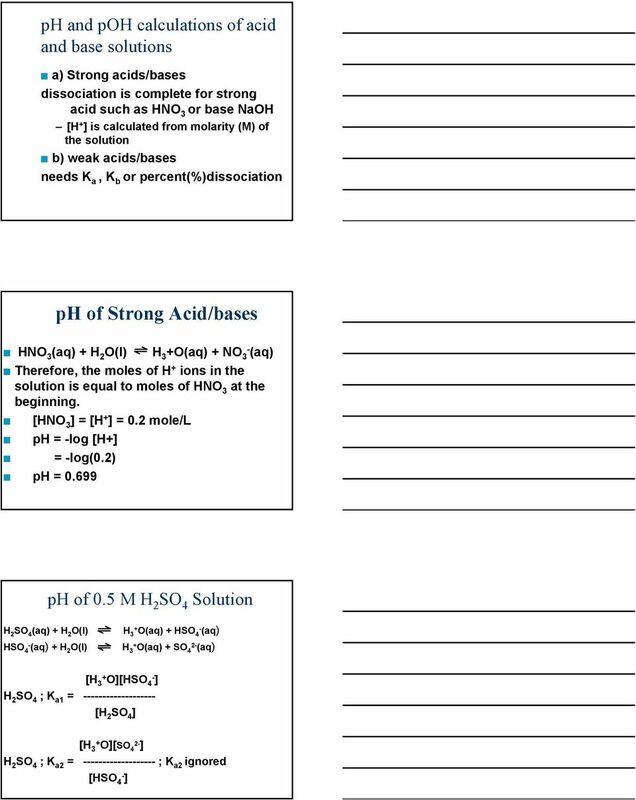 Download "Types of Reactions. What are Acids &Bases? Chapter 15. Acids & Bases. Definition? a) Arrhenius. b) Bronsted-Lowry. c) Lewis"
4 Acidic Oxides These are usually oxides of nonmetallic elements such as P, S and N. E.g. NO 2, SO 2, SO 3, CO 2 They produce oxyacids when dissolved in water Basic Oxides Oxides oxides of metallic elements such as Na, K, Ca. They produce hydroxyl bases when dissolved in water. e.g. CaO + H 2 O --> Ca(OH) 2 Protic Acids Monoprotic Acids: The form protic refers to acidity or protons. Monoprotic acids have only one acidic proton. e.g. HCl. Polyprotic Acids: They have more than one acidic proton. e.g. H 2 SO 4 - diprotic acid H 3 PO 4 - triprotic acid. 11 What is K w? H 2 O(l) + H 2 O(l) H 3+ O(aq) + OH - (aq) This dissociation is called autoionization of water. 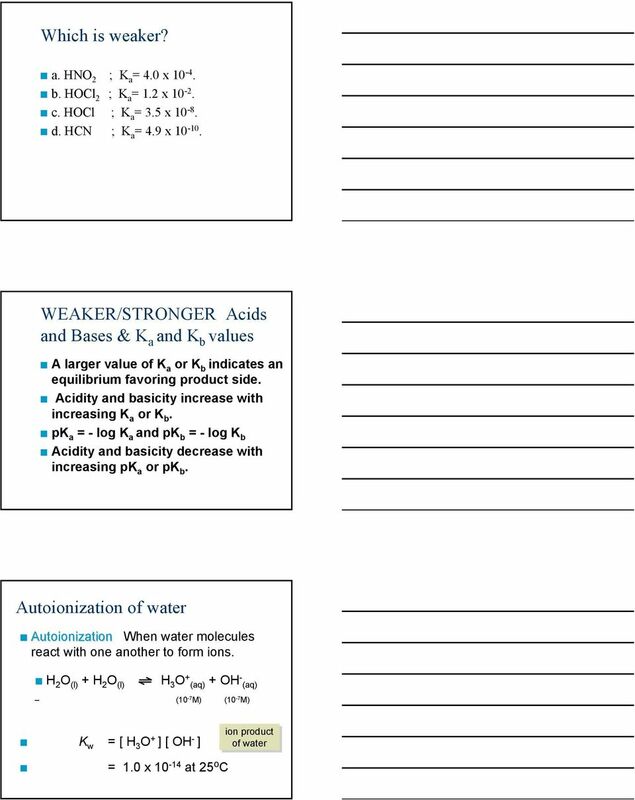 Autoionization of water: K w = [H 3+ O][OH - ] K w is called ionic product of water K w = 1 x Why is water important for acid/base equilibria? Water is the medium/solvent for acids and bases. 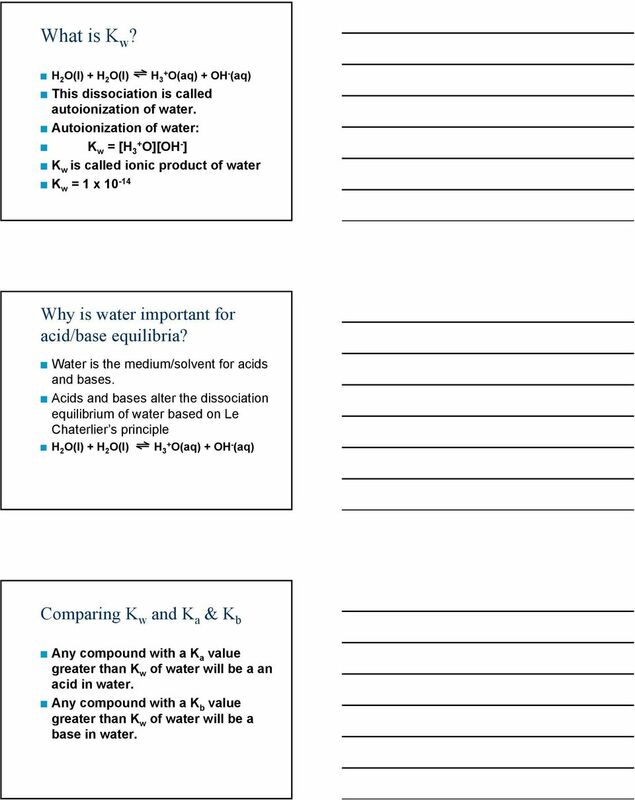 Acids and bases alter the dissociation equilibrium of water based on Le Chaterlier s principle H 2 O(l) + H 2 O(l) H 3+ O(aq) + OH - (aq) Comparing K w and K a & K b Any compound with a K a value greater than K w of water will be a an acid in water. 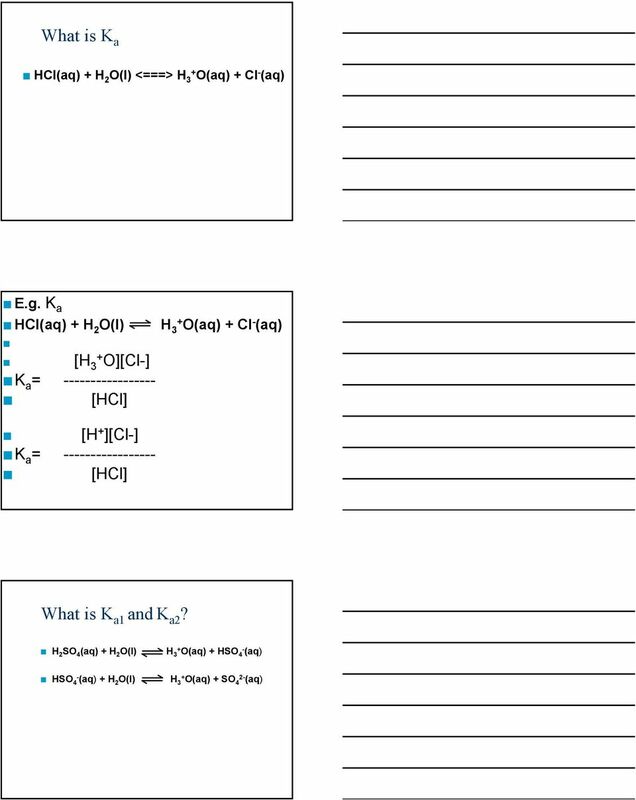 Any compound with a K b value greater than K w of water will be a base in water. 13 What is ph? K w = [H 3+ O][OH - ] = 1 x [H 3+ O][OH - ] = 10-7 x 10-7 Extreme cases: Basic medium [H 3+ O][OH - ] = x 10 0 Acidic medium [H 3+ O][OH - ] = 10 0 x ph value is -log[h + ] spans only 0-14 in water. ph, pk w and poh The relation of ph, K w and poh K w = [H + ][OH - ] log K w = log [H + ] + log [OH - ] -log K w = -log [H + ] -log [OH - ] ; previous equation multiplied by -1 pk w = ph + poh; pk w = 14 since K w =1 x = ph + poh ph = 14 - poh poh = 14 - ph Strong acids Acid and Base Strength Ionize completely in water. 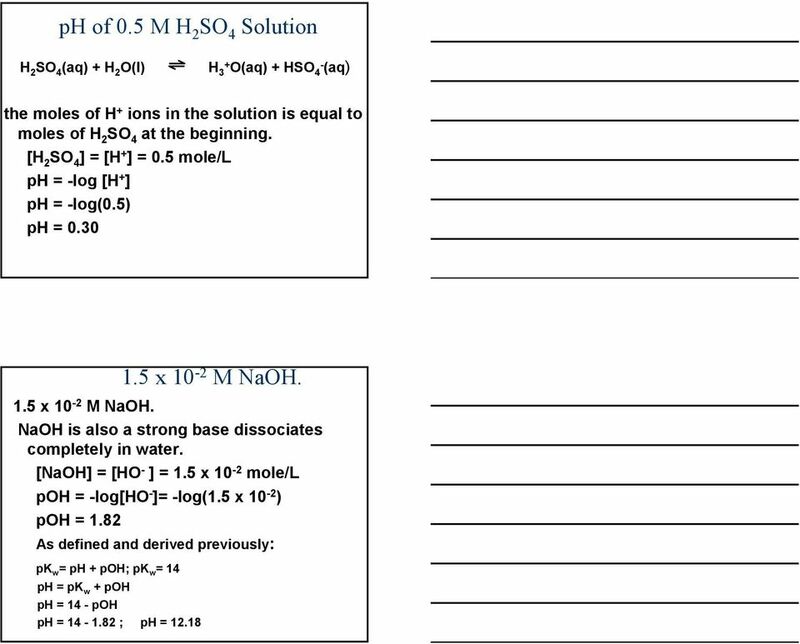 HCl, HBr, HI, HClO 3, HNO 3, HClO 4, H 2 SO 4. Weak acids Strong bases Weak bases Partially ionize in water. Most acids are weak. Ionize completely in water. Strong bases are metal hydroxides - NaOH, KOH Partially ionize in water. Acids and : A Brief Review Acids: taste sour and cause dyes to change color. : taste bitter and feel soapy. Arrhenius: acids increase [H ] bases increase [OH ] in solution. Arrhenius: acid base salt water. 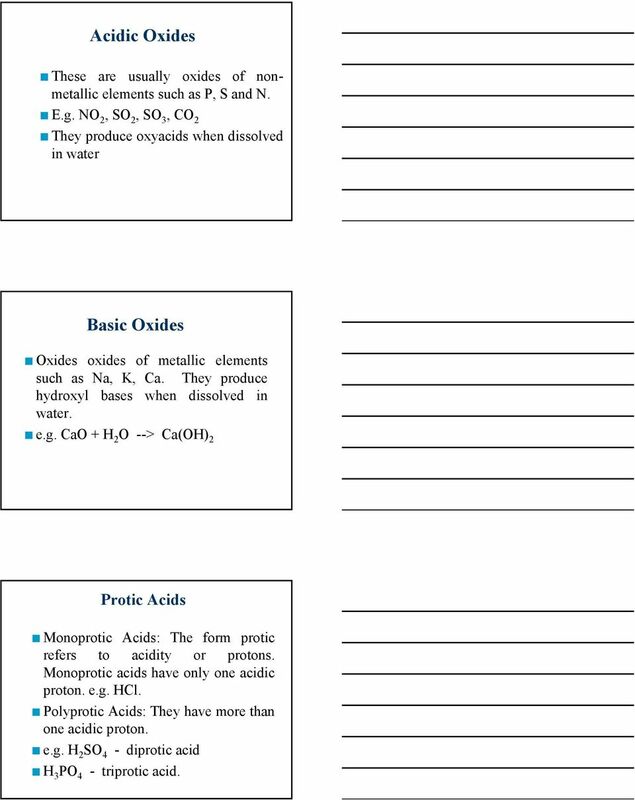 Ch Acids and Bases. Arrhenius Definition Acids produce hydrogen ions in aqueous solution. Bases produce hydroxide ions when dissolved in water. Ch 15-16 Acids and Bases Arrhenius Definition Acids produce hydrogen ions in aqueous solution. Bases produce hydroxide ions when dissolved in water. 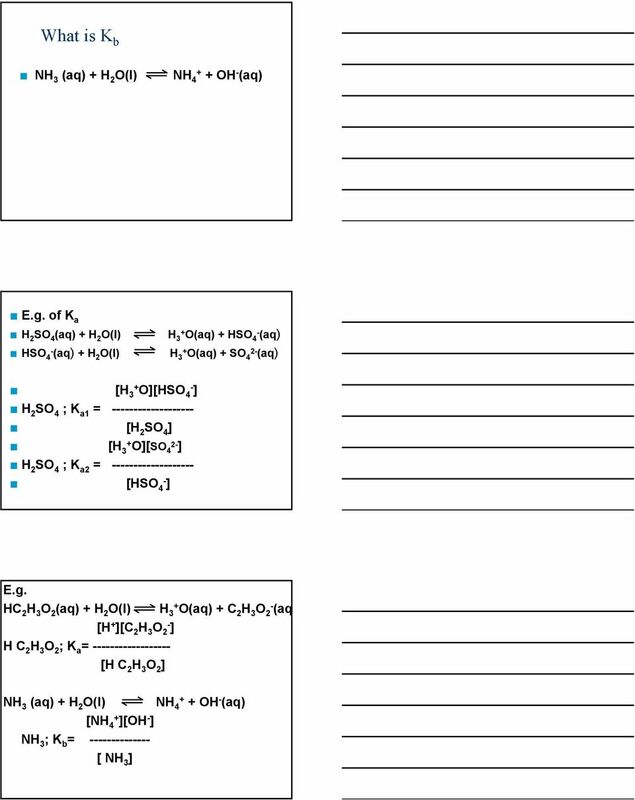 Limits to aqueous solutions. Only one kind of base. 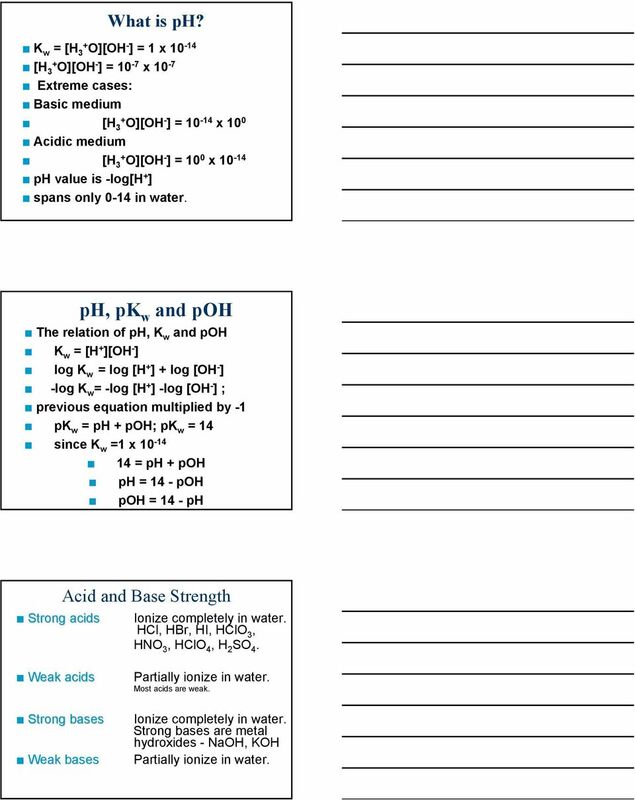 Chapter 16 Acid-Base Equilibria Learning goals and key skills: Understand the nature of the hydrated proton, represented as either H + (aq) or H 3 O + (aq) Define and identify Arrhenuis acids and bases. Since we will be dealing with aqueous acid and base solution, first we must examine the behavior of water. Name: Per: Date: Unit 11 - Acids, Bases and Salts Chemistry Accelerated Chemistry I Define each of the following: 1. Acidic hydrogens. ionic substances (separate) based on! Liquid Mixtures miscible two liquids that and form a immiscible two liquids that form a e.g. Chapter 16 AcidBase Equilibria Acids and bases are found in many common substances and are important in life processes. 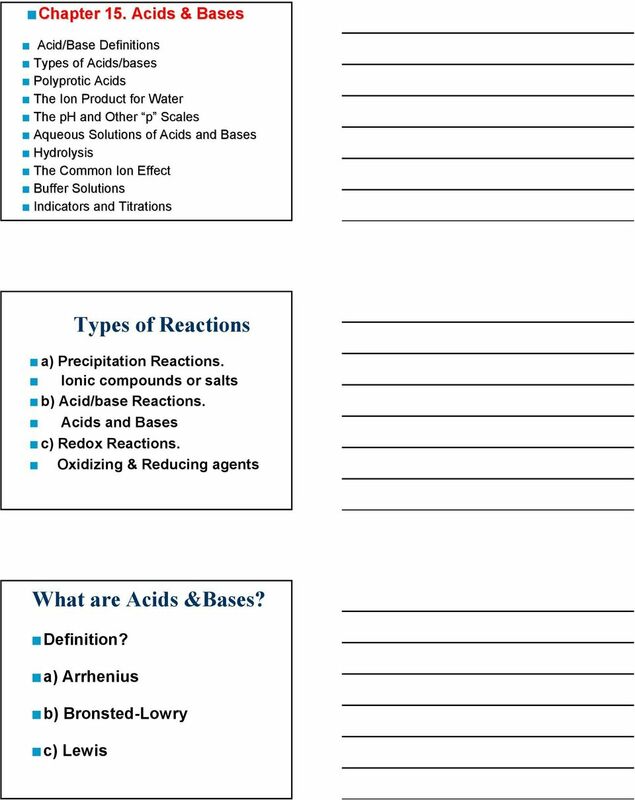 Group Work: Make a list of some common acids and bases. How do we know which is which? Answer the following questions on notebook paper, to be collected and graded for correctness. CHAPTERS 15 FAKE TEST QUESTIONS. 1. According to the Brønsted Lowry definition, which species can function both as an acid and as a base? An acid is a substance that produces H + (H 3 O + ) Ions in aqueous solution. A base is a substance that produces OH - ions in aqueous solution. 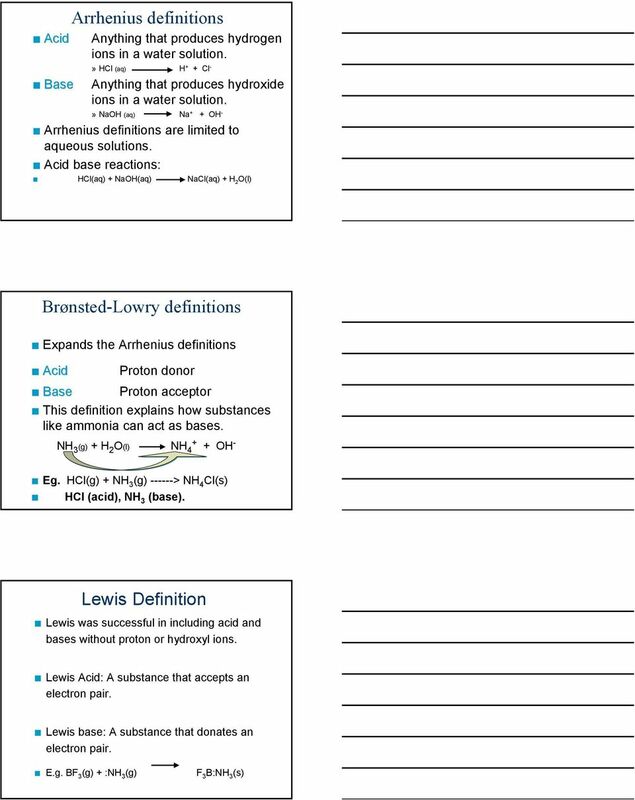 Chapter 8 Acids and Bases Definitions Arrhenius definitions: An acid is a substance that produces H + (H 3 O + ) Ions in aqueous solution. A base is a substance that produces OH - ions in aqueous solution. Q.1 Classify the following according to Lewis theory and Brønsted-Lowry theory. Acids and Bases CHEM 102! T. Hughbanks! Basic Definitions & Concepts Most basic concepts are given clearly in your text - these notes will only list these as topics discussed, so there will be less detail.! 6) Which compound is manufactured in larger quantities in the U.S. than any other industrial chemical? 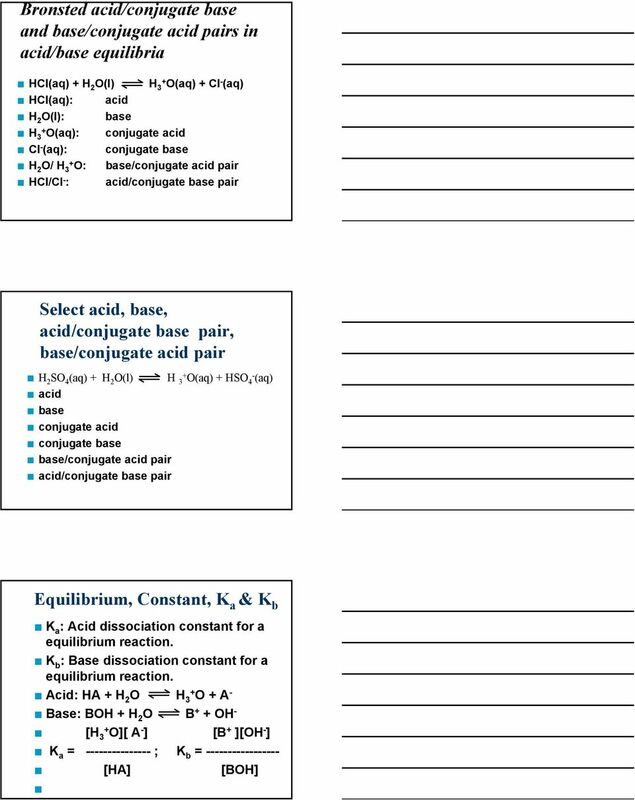 Write the acid-base equilibria connecting all components in the aqueous solution. Now list all of the species present. 1. 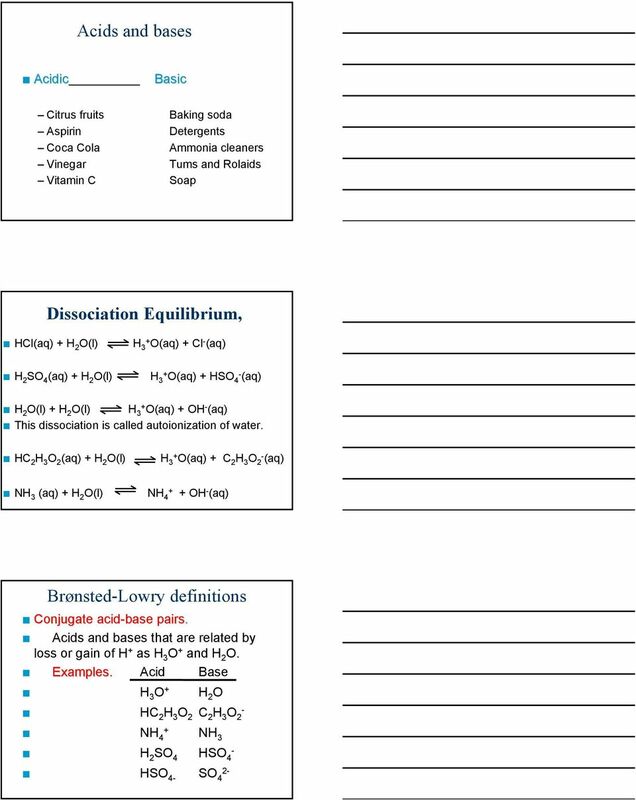 Identify the Bronsted-Lowry acids and bases and the conjugate acid base pairs in the following reactions. 2H 2 O H 3 O + + OH Hydronium ion hydroxide ion Q: But how often does this happen? This is the fundamental concept of all acid-base chemistry In pure water, how much of it is water and how much is ions? 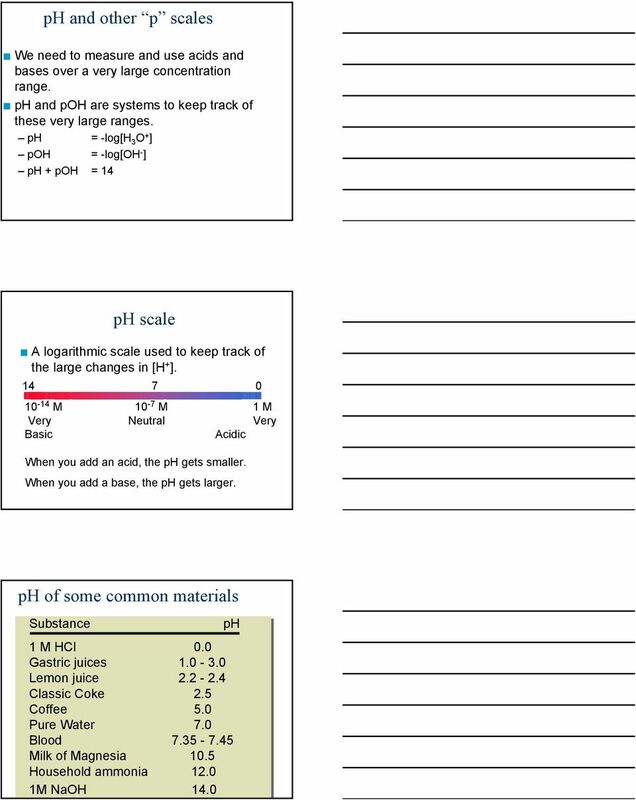 ACID-BASE REACTIONS/ THE PH CONCEPT. CHEM 1212 Test II. MULTIPLE CHOICE. Choose the one alternative that best completes the statement or answers the question. 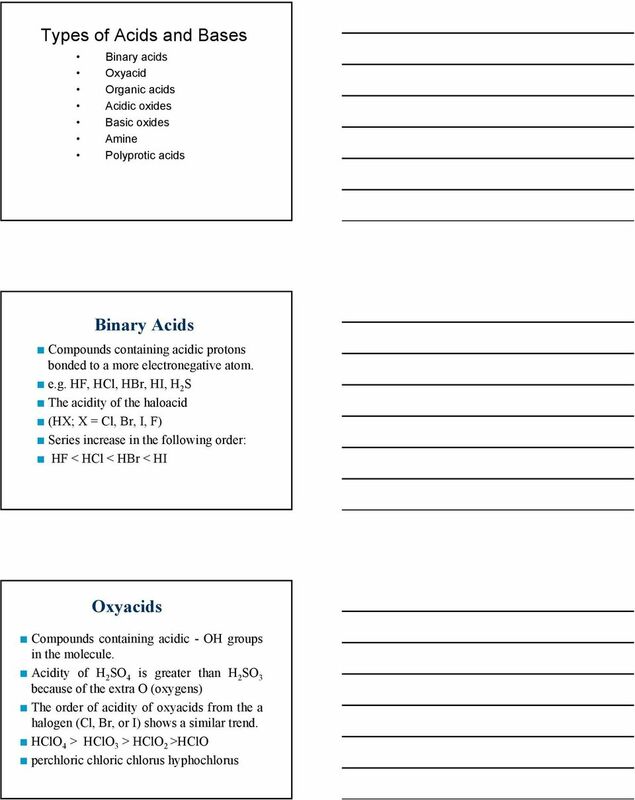 Chapter 15 Acids and Bases reading guide. 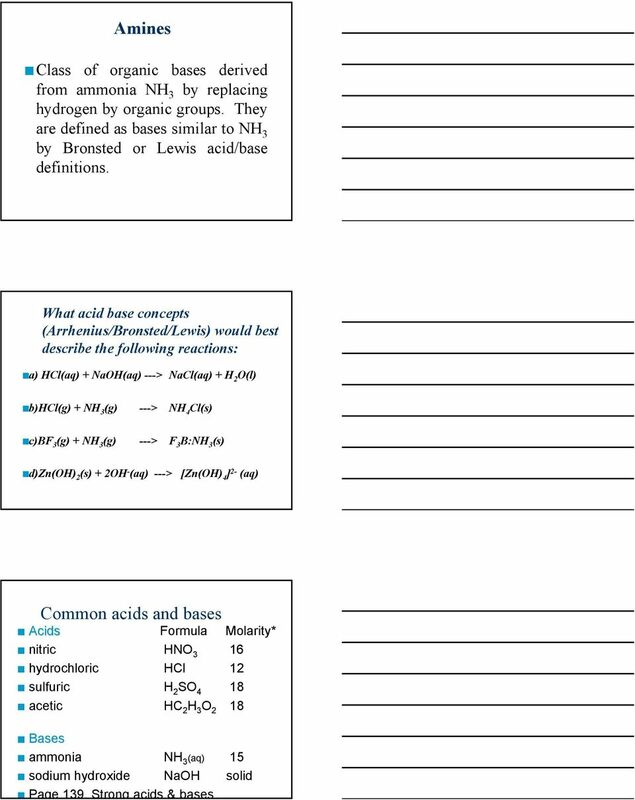 Stoichiometry and Aqueous Reactions (Chapter 4) Chemical Equations 1. Balancing Chemical Equations (from Chapter 3) Adjust coefficients to get equal numbers of each kind of element on both sides of arrow. Aqueous Solutions. Water is the dissolving medium, or solvent. Some Properties of Water. A Solute. Types of Chemical Reactions.